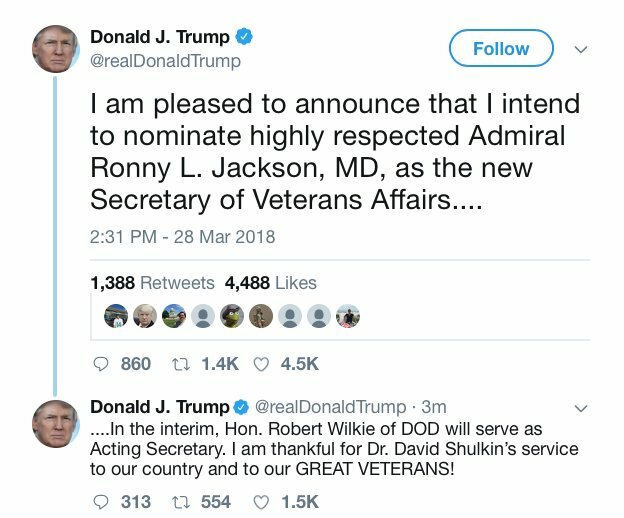 President Donald J. Trump has nominated the highly respected Admiral Ronny L. Jackson, MD, as the new Secretary of Veterans Affairs. In a tweet @realDonaldTrump, the President made this known and also announced that for the interim, Hon. Robert Wilkie of DOD will serve as Acting Secretary. The President also thank Dr. David Shulkin’s the immediate VA secretary for service to the country and to the GREAT VETERANS!